Hi! My name is Amelia, and I’m a sophomore English major and marketing minor from Princeton, New Jersey. This semester, I’ve been studying abroad in Berlin, Germany (the coolest city on Earth). So far, the semester has been a whirlwind of new experiences. Before this trip, I had barely traveled outside of the United States, and now every weekend I can hop on a plane to a new country. 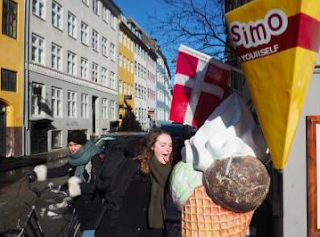 I’ve eaten waffles in Brussels, visited Neuschwanstein Castle (aka Sleeping Beauty’s Castle) in Schwangau, Bavaria, jumped on in-ground trampolines in Copenhagen, and eaten fondue in Zurich. (Okay, you caught me; two of those were about food). Of course, one of my favorite things to do when I go to a new city is take a free walking tour! What can I say - I love a good tour. 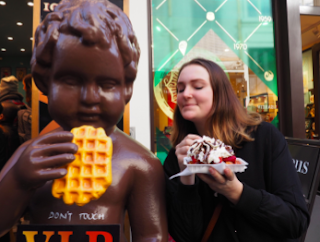 Me in Brussels, Belgium, eating the best waffle of my life with this handsome fella. Even though I spend a lot of weekends in new cities, Berlin is the best home base I could ask for. It’s a hub for everything from business to the arts. There’s also so much history here, which means there are hundreds of amazing museums to visit. In fact, people in Berlin like to boast that they have more museums than rainy days. Berlin also has a huge outdoor market every Sunday in Mauerpark. It’s full of art, jewelry, vintage clothing, and street food. In the warmer months, they do karaoke there (catch me in May, belting TLC’s No Scrubs). 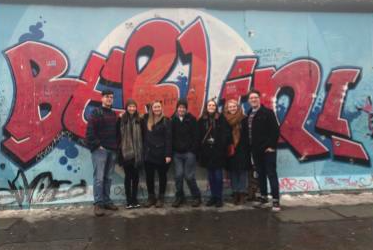 Me and my new friends outside the Berlin Wall. In addition to having the best time of my life, I’m also actually studying here. I’m in a program that does intensive German language classes, which means that I have three hours of German every morning on Monday through Thursday. I also take a literature class that focuses on books written in or about Berlin and a class about the relationship between Pop Culture in America and Europe. Even though it’s a lot of work, I love it. Here’s a picture of me in Copenhagen, attempting to fulfill my dream of eating gelato in every European country. Studying abroad is so surreal. If you had told me in high school that in a couple years I would be traveling across Europe with people I had just met (and having an amazing time doing it) I’m not sure I would have believed you. Even though I miss Hofstra and my friends there (and of course my fellow Pride Guides), I wouldn’t trade these experiences for the world. And sometimes I’m able to find a little bit of home here! 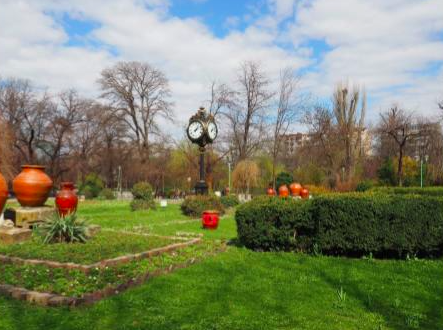 Is this clock tower in Bucharest, Romania, or outside of Hofstra’s student center? We’ll never know.